All Chair Rails feature heavy duty solid Aluminum construction while adding tremendous visual punch to any space. Stunning metals make our chair rail look like nothing else on the market. But don't forget about the tough protection that only a metal Chair Rail can offer. Chair Rails protect walls where they are vulnerable the most - at chair height. Our Diamond plate chair rails can take a beating from chairs, carts, hand trucks and still look great. Our 4" size is the most popular. Our 8" size is our largest and creates the ultimate showroom effects. Available 8 ft lengths as well as custom sizes. Check out all of the stunning metals and beautiful anodized colors. Looks great, works even better. Liquid Nails (Click Here!) 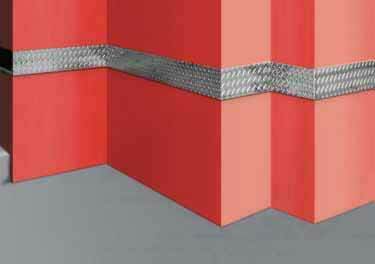 to create a strong bond for installing all Diamond Plate products. Use for industry, factory, office, retail spaces, workshop, garages, kitchens, tradeshows and more. check out our garage/office storage units! Liquid Nails adheres moldings quickly. cuts and drills like traditional trim. Use cutting blade designed for sheet metal. Not the imitation stamped metal that others use. Is your chrome color diamond plate chair rail aluminum? What is the thickness? Thank you! Diamond Plate Chair Rails contribute a dramatic look to a room and protect walls from chairs and carts. They offer the heavy duty protection of solid metal. We have ordered and used the diamond plate chair rail product in our offices and workrooms twice now. It is easy to work with and apply. The result is a neat industrial finish that we like. Thanks. Thank you for your review and thanks for your repeat business. We are glad it serves a nice decorative purpose in your office and workroom. I am an Interior Decorator/Designer and I used this product in the head office of a sports store. The results were amazing and the client was thrilled. Great product, easy to cut and install. I have tried everything to keep the scuffs and marks off the walls. I tried these and they are great. Look good, and very strong. Great pricing too. Looks great in my son's redecorated bedroom. He loves the look and so do I!! Looks great, easy to install, but a little difficult to cut. Diamond plate chair rail looks great in my Dream Garage! I AM A BARBER SHOP OWNER IT HAS SAVED MY WALLS FROM THE WAITING AREA CHAIRS THE BEST PRODUCT EVER. I am a retired firefighter remodeling my basement into a "mancave". Wanted to have a fire department theme so I found your diamond plate chair rail and thought it would add to the theme. I was absolutely correct! Your site was easy to use and your staff most helpful in answering my questions. Was easy to install and looks great. Would recommend to anyone! Ordered diamond plate chair rail for the garage. While the instructions indicated there was a self adhesive back, there wasn't. This did not pose a problem as I didn't expect adhesive. The product went up fast with construction adhesive, formed well around corners and looks great! Would be a little better if the diamond pattern matched end for end. This would have made the butted seams look less noticeable. For a custom- industrial look, I highly recommend it. Ordering process went well and product arrived sooner than expected. I'm in a wheelchair and have banged into my stainless steal kitchen appliances. So i wanted to improve the look without having to spend a lot of money. These fit the bill. They looks like stainless steel just lie dishwasher etc. I will have to figure out how to cut them to size as they are too long right now. So I haven't put them up yet. But they look very stylish and I think this will make a big difference. Trim out your workspace with Diamond Plate Base Molding. From countertops to concrete, liquid nails Heavy Duty Adhesive creates flexible, impact-resistant bond.